A wonderful combination of both vegetable and starch. Great high protein side for fish or chicken or keep it light with chopped tomatoes, cucumber and red onion salad. Heat oil in a pot over medium heat. Add onions and sautée for 2 minutes or until softened. 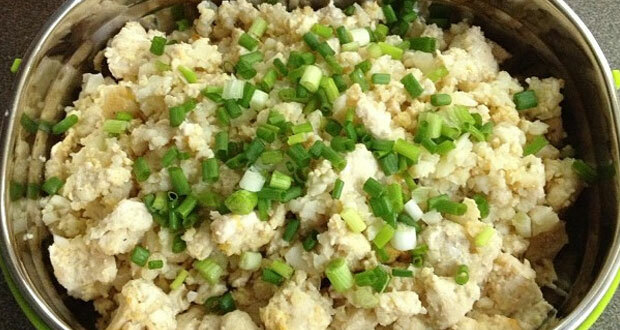 Add cauliflower and cook, stirring occasionally, for 5 minutes or until lightly browned. Stir in chili and garlic and sauté for 1 minute, then add rice and stir until well coated with oil. Add coconut milk, water, cloves, cinnamon stick and salt and bring to a boil. Cover pot, turn heat to low and cook rice for 15 minutes or until rice is cooked and liquid has been absorbed. Remove from heat and let stand for at least 5 minutes to steam before serving. Remove whole spices if desired. Sprinkle with almonds and mint.